As well as the revelation that four WiiWare demos will launch across Europe this week, we also have brand new games for DSiWare and WiiWare as well. ThruSpace (Nintendo, 800pts) – A Nintendo-published puzzle game, this is the first ever WiiWare game to launch with a free playable demo. It's been out in America for a while, so you can read our ThruSpace review, and play the demo, to see if this is the one for you. Jett Rocket (Shin'en Multimedia) – A graphically resplendent 3D action adventure, this game is a masterful technical achievement for WiiWare and a lot of fun to boot. Read our Jett Rocket review ahead of the demo's launch. Furry Legends (Gamelion Studios) – A platform game that revolves around a furry ball, our Furry Legends review sorts the lint from the fluff. Zombie Panic in Wonderland (Akaoni Studios) – Watch out, zombies are hugging people to death! Better blow them away with your weapons to survive through nine stages of arcade-style gameplay. Marvel at what big eyes our Zombie Panic in Wonderland review has. ThruSpace (Nintendo) – Our ThruSpace review makes the perfect accompaniment to the new demo launching on Friday. Bookworm (PopCap, 500pts) – This wordy puzzle game has been out in North America for nearly a year, but gamers Down Under and in continental Europe beware: this game will only be available in the UK and Ireland. Reading our Bookworm review might remove some of the sting. GO Series: Fatal Blow (Gamebridge, 200pts) – Better known in the US as G.G Series: Super Hero Ogre, this is a tough side-scrolling title that puts you in the shoes of a superhero. Our GO Series: Fatal Blow review wasn't overly thrilled with the game but if you like a challenge you might find some value here for your 200 Points. Rytmik: Rock Edition (Cinemax, 800pts) – The rocking follow-up to Rytmik, Rytmik: Rock Edition is a portable music studio with a bigger focus on guitars, live-sounding drums and organs than its dance-based predecessor. We were very impressed with the original release, as you can read in our Rytmik review, so hopes are high this will turn out to be just as good. The official Rytmik: Rock Edition website has some sample songs to tide you over until you can make your own on Friday. This week sees the launch of a new service added to the Wii Shop Channel, in the form of ongoing downloadable WiiWare demos. 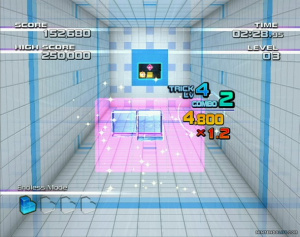 Containing a taster of the full version of a WiiWare game, WiiWare demos offer players the ability to trial select WiiWare games without using up any of their Wii Points, giving players the enjoyment of testing out the game before ultimately deciding whether to download the full version of the game or not using their Wii Points. Every WiiWare demo featured on the Wii Shop Channel will be available for a limited time only ensuring the line-up is constantly kept refreshed to provide players with a varied and entertaining experience. Players will be able to see the WiiWare demos currently available for download via a dedicated list on wiiware.nintendo.co.uk as well as on the Wii Shop Channel itself. Available across Europe from the 5th November 2010, players will be in for a treat as four WiiWare demos are made available to play including Furry Legends Demo (Gamelion), Jett Rocket Demo (Shin’en Multimedia), ThruSpace™ Demo (Nintendo) & Zombie Panic in Wonderland Demo (Akaoni Studio). As if that wasn’t enough, there’s also an array of new, full version WiiWare & Nintendo DSiWare games available for download this Friday. From a reaction taxing puzzle with ThruSpace™: High Velocity 3D Puzzle on WiiWare, to the brain-teasing Bookworm™, on Nintendo DSiWare. And whatever hero you worship, from superhero to rock hero, GO Series: Fatal Blow and Rytmik Rock Edition on Nintendo DSiWare have them both. ThruSpace™: High Velocity 3D Puzzle is a unique 3D puzzle game that will test your spatial awareness and reactions to the limit. Players must guide a ‘Keydron’ - a simple geometrical shape, travelling at speed - through gaps in a series of walls, rotating the Keydron to the correct angle in order to fit through. The more walls you pass through, the higher your score will become; keep an eye out for crystals along the way, as every crystal you manage to collect will boost your points. Once you've mastered the basics, go a step further and learn how to do tricks and combos - skills you’ll find useful to score additional points. You’ll notice that some gaps in the walls are bigger than the Keydron – use your skills to fill the entire space with the Keydron's shadow before passing through it, and you’ll increase your score. There are three modes to enjoy: ‘Normal’, ‘Endless’ and ‘Trick Challenge’; you can even save three of your best runs as watchable replays in ‘Keydron Memories’ mode. As if that wasn’t enough, the online leaderboard allows you to compare scores and compete with players around the world, via Nintendo Wi-Fi Connection service. This title launches with a free demo, available for download for a limited period. Players must connect letter tiles - left, right, up and down - to build words and satisfy Lex’s appetite in ‘Bookworm Classic’ mode. Watch out for burning letters though — they could spell disaster for you and Lex. You can use ‘Reward Tiles’ and spell ‘Bonus Words’ to boost your score, as well as linking your best words to enter the Hall of Fame. With unlimited levels of word-puzzle fun, you’ll enjoy exercising your brain and learning new words on the go every time you play! 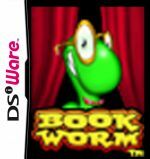 Bookworm™ is only available for download, via Nintendo DSiWare, to players based in the UK and Ireland. GO Series presents Fatal Blow from Suzak. Confront an evil army and save the day in this superhero fighting game. Each time you defeat an enemy with a ‘Hero Attack’, the ‘Hero Gauge’ increases. Use simple button commands to charge-up the ‘Hero Gauge ‘and unleash powerful ‘Superhero Attacks’ on your foes. Continue to land ‘Hero Attacks’ in a bid to keep the ‘Hero Gauge’ charged and perform a devastating chain of Superhero Attacks. Rytmik Rock Edition is an application for creating both rhythmical and melodic themes as well as whole songs. It blends the fast and well-arranged interface of classic drum machines with the flexible pattern interface of popular trackers and a modern sound library. As if that wasn’t enough, Rytmik Rock Edition also contains more than 130 carefully selected sound samples of drum set, keyboards, bass, clean, lead and rhythm guitars instruments. With Rytmik Rock Edition you can quickly and easily create the basic music building block – an audio clip. It consists of musical notations for up to four instruments that you may transpose, select their location in the stereo field, and modify their volume, polyphony (with extended polyphony handling), chorus/widening stereo effect and echo. You can also combine up to 128 audio clips in four tracks to create complex pieces of music. To help you on your way, you’ll discover a collection of 10 pre-made compositions at your disposal, with which you can quickly compose your own pieces. However, Rytmik Rock Edition is not only for playing with sounds; in the hands of a skilful musician it can become a serious musical instrument and a surprisingly powerful, pocket music station. With Rytmik Rock Edition you’ll become the king of the rock party in no time. Lemme know how the demoes go, and I see that the DSiWare line-up ain't bad neither. Speaking about waiting, where is Fate? That's amazing, when I saw Thruspace I thought of getting it, but the demo means I can make sure. And a Jett Rocket demo? I've been swearing hard every time we get these download lists for the last month! No Shantae and no Zenonia! C'MON!! This would be an okay demo, but since I'm only interested in DSiWare at the moment, it's another garbage week. I won't be getting any of these but at least there aren't any bad games released this week. ARRGH!! GIVE US CAEV STORY NINTENDO OF EUROPE!! Shantae would be smashing too! I have to add, I'll be getting Rytmik Rock though. Thruspace and Bookworm please.Where r ALL the other popcap games for the EU btw? Great, demo's. Thruspace is on my list, but I really wanted to try it for myself. Same for Furry Legends. Now that's finally possible. I already own the other two. BTW, they better not screw up the list again with the demo's. I would hate to have a top 16 again. Hey wait, first ever WiiWare game to launch with a demo? Pokemon Rumble did that last year. Well aside from the demos there's only one thing for Wii which is a bit lame. And the demoed games I'd be interested in I've already bought anyway! More demos, about time for crying out loud. Already have Zombie Panic and Jett Rocket. Both great. I'm going for thruspace based on the revw. I want to try put the furry l demo as i'd dismissed that based on the floaty controls. Hopefully now we'll start to get ware and retail ds popcap games in the EU as well as more demos. The OFLC rating costs too much (it costs the same as a full retail one, which isn't fair given how the games have less of a budget, developers have kept asking for this to change) and I can only assume PopCap don't think they'll make a return on the rating so no rating and no game. In the case of Tales in a Box: Hidden shapes in perspective! they obtained an OFLC rating for game called Looksley's Line Up instead (that being the US name as generally at retail they get US DS games and EU Wii games) so they had to withdraw Tales in a Box: Hidden shapes in perspective! from the DSi shop until they re-rated it. I wanted Virtual Console games !! I don't like the WiiWare ! !